Sales and profits are up at Black Country food company East End Foods. The West Bromwich-based supplier of Indian foods turned over £178 million in the year to April 2016, with profits pushing £5 million from £4.5 million the year before. East End Foods was established by Tony Deep Wouhra MBE and his four brothers. More than 40 years ago they spotted a gap in the food market after the surge of immigration to the UK from the sub-continent in the 50s and 60s. Seeing growing demand and limited supply of ethnic food products, they set up East End Foods in Wolverhampton. They opened a small shop and began door-to-door delivery. The interest grew, as did the business. The business moved into Birmingham in the 1970s, establishing a base in Highgate supplying Indian restaurants, stores and independent retailers. Today, East End Foods is one of the leading suppliers of Asian food in the UK and European markets. It employs almost 350 staff at its base in Kenrick Way, West Bromwich, including 23 members of the Wouhra family. It is run by Jason Wouhra who is also chairman of the West Midlands Institute of Directors. East End Foods stocks more than 1200 items sourced from around the globe and nearly every Asian supermarket or shop in the UK stocks the firm’s products, which include spices, lentils, sauces, rice and oils. East End Foods opened the largest rice mill in Europe in 2006 and has a distribution centre in Smethwick. The company has a philosophy of using the best raw materials and producing food in a sustainable way. The firm produces 75 per cent of its own energy requirements and has installed more than 600 solar panels on the roof of its Aston Cross depot. The firm also has a huge cash and carry warehouse on the site of the former HP Sauce factory. East End Foods co-founded the Healthy Hearts Institute in co-operation with Sandwell and West Birmingham hospitals. The charity offers a free screening service and advice for diabetes, high blood pressure and cardiovascular disorders. Tony Deep Wouhra, 74, came to the UK in 1961 from Delhi where he was a science student. He had just £3 in his pocket. He was just 18 and had never ventured outside the country before. He settled in Wolverhampton where he met his wife Barbara. 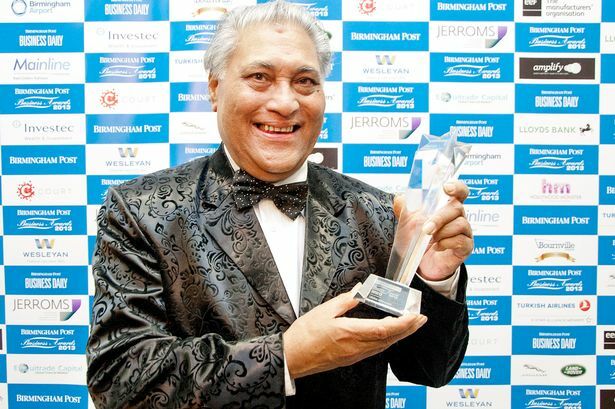 In 2010 he was awarded the MBE for services to ethnic food.